The Carr fire in Redding, California burned 229,651 acres and is California's seventh largest fire on record. The simultaneously burning Mendocino Complex fire is California's largest fire on record, having burned 459,123 acres. The previous record holder, the Thomas fire, began just 8 months prior. Fifteen of California's 20 largest wildfires on record have burned since 2000. The Carr fire has burned 1,599 structures, including 1,077 residences, and is California's 6th most destructive wildfire on record. California has experienced six of its most destructive wildfires in just 10 months. Rising temperatures and drier conditions linked to climate change are making California fires larger, more dangerous and more expensive to fight. The Carr fire erupted amid Redding's third hottest July on record, and temperatures in the northern Sacramento Valley were as much as 10°F above average for months. On August 2, the Carr fire grew to become one of California's 20 largest wildfires on record, pushing the Campbell Complex from 1990 off the list. The Carr fire ultimately burned 229,651 acres and is California's seventh largest fire on record. As of August 7, the Carr fire was California's 6th most destructive on record, having burned 1,599 structures. California has experienced six of its most destructive wildfires in just 10 months. Even by July standards, this is an unusually long July heat wave with triple-digit heat in areas for three weeks straight. And the night that the fire went off, temperatures were well above 110 degrees. In cases like this, there's an undeniable link to climate change. The Carr fire began late on July 23 and tripled in size overnight on July 26 and 27 amid scorching temperatures, low humidity and windy conditions. 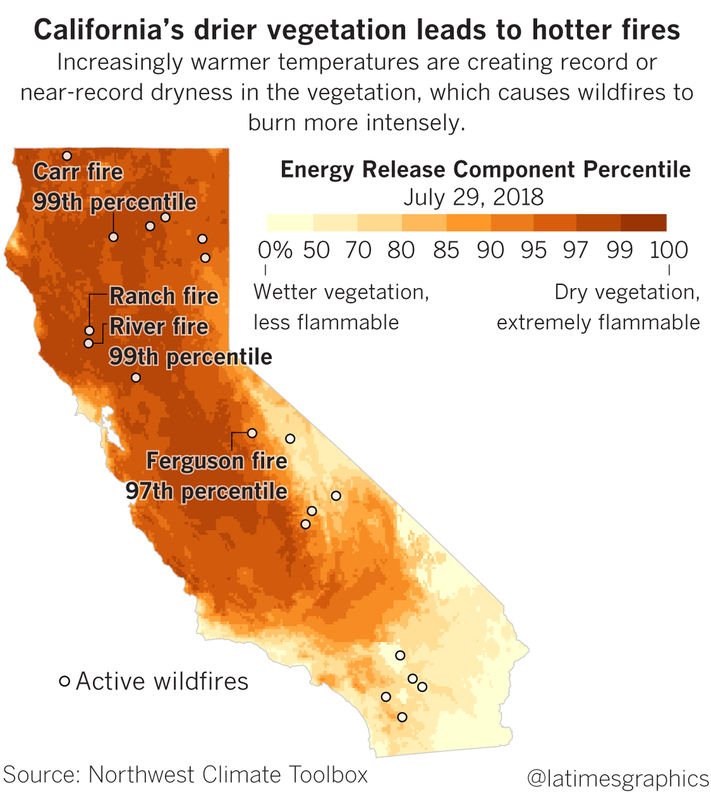 California temperatures were as much as 10°F higher than normal in the months leading up to the Carr Fire. Redding had its third hottest July on record. Data show a direct link between climate change, surface dryness (as measured by vapor pressure deficits), and increased wildfire risk in the western United States. Between 2000–2015, human-caused temperature increase and vapor pressure deficit contributed to 75 percent more forested area in western US forests experiencing high fire-season fuel aridity. During this same period, high temperatures and VPD also added nine additional days per year of high fire potential. In 2015-2016, human influences quintupled the risk of extreme vapor pressure deficits for western North America. Looking further back in time, human-caused climate change accounts for 55 percent of observed increases in fuel aridity from 1979-2015 across western forests. A major cause of the Carr fire's rapid spread was the exceptionally dry landscape, which produced intense heat, high into the atmosphere. This produced embers that could spread far away, rapidly expanding the reach of the flames. Intense heat shot hot air up to 39,000 feet into the sky at speeds of up to 130 mph. California experienced its second driest December 2017 - February 2018 on record, which is the period during which the state receives most of its annual precipitation. Months of above-average temperatures left the northern Sacramento Valley bone-dry and ready to explode. Vegetation moisture in many areas in northern California were at or near record low levels at the end of July. Winter rain and snowfall in the mountains provides most of the water resources for California’s urban and agricultural needs. The water is stored for use as snowpack in the mountains, surface water in huge artificial reservoirs, and groundwater in aquifers. Increases in winter temperature due to climate change disrupt rain and snowfall trends in California. They increase the ratio of water that falls as rain instead of snow, cause snowpack to melt earlier, and increase the risk of extreme and prolonged drought. The Sacramento River is already seeing earlier runoff due to snowmelt occurring earlier, and a number of scientists attribute that to climate change. We're getting warmer and warmer conditions around the globe but certainly here in California and in the western United States we're getting earlier melting of snowpack. That means that when those warm conditions happen in the summer and fall all the vegetation is even more dried out and that means that when lightning strikes, or when a spark from a car or a campfire hits the ground, that the vegetation is more dried out. There's more fuel available.